Researchers affiliated with the Graphene Flagship have shown that integrated graphene-based photonic devices offer a unique solution for the next generation of optical communications. Researchers in the initiative have demonstrated how properties of graphene enable ultra-wide bandwidth communications coupled with low power consumption to radically change the way data is transmitted across the optical communications systems. This could make graphene-integrated devices the key ingredient in the evolution of 5G, the Internet-of-Things (IoT), and Industry 4.0. "As conventional semiconductor technologies are approaching their physical limitations we need to explore entirely new technologies to realize our most ambitious visions of a future networked global society," explains Wolfgang Templ, Department Head of Transceiver Research at Nokia Bell Labs in Germany, which is a Graphene Flagship partner. "Graphene promises a significant step in performance of key components for optical and radio communications beyond the performance limits of today's conventional semiconductor-based component technologies." Paola Galli, Nokia IP and Optical networks Member of Technical Staff, agrees: "Graphene photonics offer a combination of advantages to become the game changer. We need to explore new materials to go beyond the limits of current technologies and meet the capacity needs of future networks." 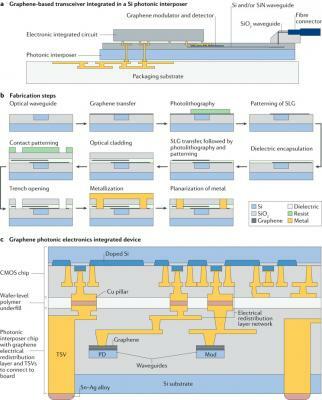 The Graphene Flagship presents a vision for the future of graphene-based integrated photonics, and provides strategies for improving power consumption, manufacturability and wafer-scale integration. With this new work, the Graphene Flagship partners also provide a roadmap for graphene-based photonics devices surpassing the technological requirement for the evolution of datacom and telecom markets driven by 5G, IoT, and the Industry 4.0. "Graphene integrated in a photonic circuit is a low cost, scalable technology that can operate fibre links at a very high data rates," said Marco Romagnoli, from Graphene Flagship partner CNIT, the National Interuniversity Consortium for Telecommunications in Italy. Antonio D'Errico from the Graphene Flagship partner Ericsson Research explains how "graphene for photonics has the potential to change the perspective of information and communications technology in a disruptive way." The team involves researchers from CNIT, Ericsson, IMEC, Nokia, Nokia Bell Labs, AMO, ICFO and the University of Cambridge. "This case exemplifies the power of graphene technologies to transform cutting edge applications in telecommunications. We already start to see the fruits of the Graphene Flagship investments when moving from materials development towards components and system level integration," explains Kari Hjelt, Head of Innovation for the Graphene Flagship. Will Nokia prototype graphene-based optical sensors in the near future?